Easy project management software for timeline, calendar, Gantt chart, pert chart, matrix, scheme drawings with abundant examples and templates, Free Download. Edraw is the easiest and best-looking way to create and share interactive project management charts. Whether you're moving into a new project, planning a calendar or reorganizing your timeline, Edraw has the right tools for you. With Edraw you can recreate your Gantt chart, pert chart or WBS chart in just a few clicks and furnish your project with ready-made templates. 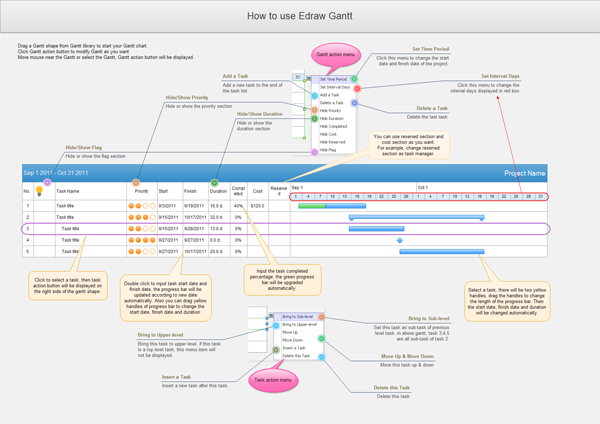 Discover why Edraw is the most superior project management chart software, Download it free. As the popular saying goes," Aim at the sky, at least you will reach top of the tree". High ambitions in life will urge you to achieve great things. But bigger success requires more, including sufficient emphasis, proper management, positive attitude and right tool. We assume you already have the first two, and we can offer you the last two with Edraw project management software. Automatic Generation - This fabulous application aids you to simply drag and drop the selected symbols into your outstanding design and arranges and aligns them automatically in a matter of minutes. Rich Templates - Contained are a wealth of templates used as the basis for project management. Templates can be used for messages, schedules, reports, task lists, and dashboard customization. Customizable Charts and Graphs - Display any kind of data in various charts and graphs like bar graphs, Gantt charts, quality function deployment and so forth. Risk Management - Team members can easily identify and raise flags over potential risks which may emerge and the consequences. When an obstacle occurs, the task of solving it can be assigned to qualified staff as soon as possible. Flexible Output - You can save the resulting drawings as projects, printed or export as PDF, HTML, Graphic Formats, TIF or others. As for the printing result, Edraw will show you the effect of what you see is what you get. Professional Support - Ongoing professional technical support is provided, for free! 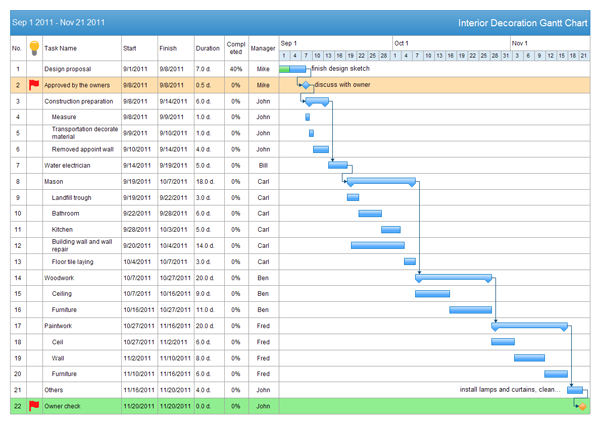 The following project management example shows the Edraw version history. You can find the free project management example on the software start page. Create professional-looking project management diagrams with minimum time loss! Click here to free download Project Management Software. Then you can use the built-in project management examples to create and present your project management rapidly.